US Airways, owned by US Airways Group, Inc. is the sixth largest airline in the United States. Headquartered in Tempe, Arizona, it is the largest low-cost airline in the United States. US Airways has a fleet of 360 mainline jet aircraft and 352 "express" (regional jet and turbo-prop) aircraft connecting 240 destinations in North America, Central America, the Caribbean, Hawaii, and Europe. As of February 2007, US Airways employs 37,675 people worldwide and operates 3,860 daily flights. 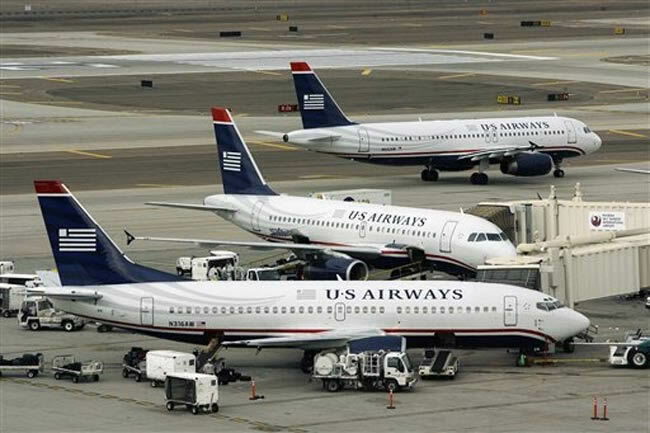 US Airways operates hubs in Charlotte, Philadelphia, Phoenix and Las Vegas. US Airways also maintains focus city operations at Washington Reagan National, New York LaGuardia, Pittsburgh and Boston. US Airways also has a partnership with Midwest Airlines at Kansas City. US Airways allows for code sharing in Kansas City with Midwest to select destinations in Arkansas, Kansas, Missouri, and Nebraska. US Airways Express serves smaller rural communities from Kansas City and uses the Midwest Airlines hub traffic to help fill the seats on these flights. The US Airways Express flights operated from Kansas City are operated by Air Midwest, which is a division of Mesa Airlines. Unisys and BusinessWeek refer to US Airways as a legacy carrier. The Las Vegas Review-Journal refers to US Airways as a low-cost airline. US Airways traces its history to All American Aviation Company, a company founded by du Pont family brothers Richard C. du Pont and Alexis Felix du Pont, Jr.. Hubbed in Pittsburgh, the airline served the Ohio River valley in 1939. In 1949, the company was renamed All American Airways as it switched from airmail to passenger service. The company was again renamed, to Allegheny Airlines, in 1952. Allegheny expanded progressively, introducing the Douglas DC-9 in 1966 and absorbing Lake Central Airlines in 1968 and Mohawk Airlines in 1972 to become one of the largest carriers in the northeastern United States. But with expansion came growing pains: by the 1970s Allegheny Airlines had earned the nickname "Agony Air" due to customer dissatisfaction with the carrier's service. Allegheny's agreement with Henson Airlines, the forerunner to today's US Airways Express carrier Piedmont Airlines, to provide service under the Allegheny Commuter banner, is generally regarded as the industry's first code-share agreement, a type of service now routinely offered throughout the industry. Alleheny changed its name to USAir in 1979 following the passage of the Airline Deregulation Act the previous year, which allowed the airline to expand its route network to the southern United States. In the early 1980s, its routes in the Northeast were fed by Ransome Airlines, among others. It was at this time with a new corporate name that the company moved its corporate headquarters from Pittsburgh to Crystal City in Arlington County, Virginia near Washington, D.C., although Pittsburgh would remain its primary hub for another two decades. USAir was a launch customer for the Boeing 737-300, as the airline needed an aircraft with greater capacity to serve its rapidly-growing Florida markets. USAir was the world's largest operator of DC-9 aircraft and approached McDonnell Douglas for a new airplane. However, in the late 1970s, the company's proposed successor to the DC-9-50 did not suit USAir's requirements. After negotiations with McDonnell Douglas broke down, Boeing stepped forward with a proposed variant of the 737. USAir chose this aircraft and the company worked closely with Boeing during its development, receiving the first plane on November 28, 1984. USAir expanded dramatically in 1987, when it purchased San Diego-based Pacific Southwest Airlines (PSA) and Winston-Salem, North Carolina-based Piedmont Airlines. The mergers gave the airline hubs in Baltimore, Charlotte, Syracuse, Dayton, routes to the West Coast, and Piedmont's transatlantic service to London Gatwick Airport. Only Baltimore and Charlotte remained hubs. When the Piedmont acquisition was completed in 1989, it was the largest merger in airline history. USAir became one of the world's largest airlines, operating over 5,000 daily flights. In the early 1990s, USAir expanded its service to Europe with new flights to London, Paris, and Frankfurt from its four main hubs. The company formed new partnerships, marketing the Trump Shuttle as the "USAir Shuttle" and accepted a large investment from British Airways that started one of the first transatlantic airline alliances. During this period several 767 aircraft were painted in the British Airways livery, but operated by USAir. It also invested heavily in a new, state-of-the-art terminal at its hub at Pittsburgh. 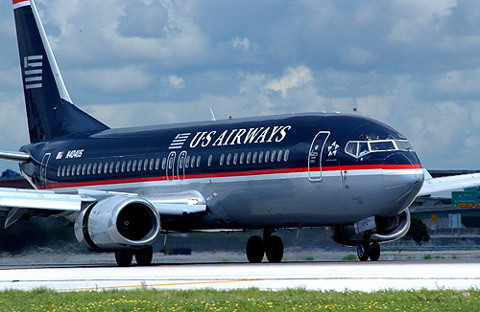 In 1996, USAir closed its relationship with British Airways and announced its re-branding as US Airways. It expanded its flights to Europe through the end of the decade, and bought out the remains of Trump Shuttle in 1997. That same year it introduced a single-class service known as MetroJet, which attempted to compete with low-cost carriers expanding into the East, in particular Southwest Airlines. On November 6, 1996, just following the re-branding to US Airways, US Airways placed an order for up to 400 Airbus A320-series narrow body aircraft, with 120 firm orders at the time of the order signing. At the time, it was regarded as the largest single aircraft order in history. In 1998, the airline followed with an order for up to 30 Airbus A330-series or A340-series widebody aircraft, with an initial firm order for 7 A330-300 aircraft. 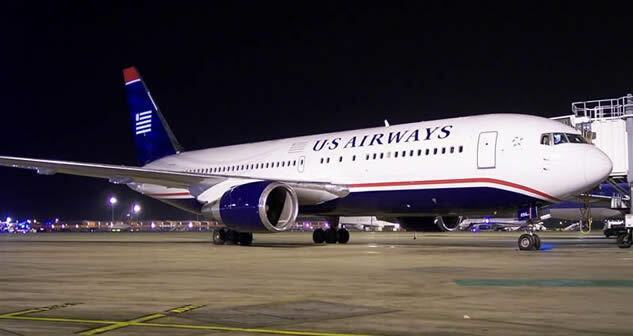 These orders accomplished two goals: 1) they allowed US Airways to replace older aircraft with newer, more efficient aircraft; and 2) helped with the re-branding and repositioning of US Airways as the "Global Carrier of Choice". Although the airline had returned to profitability in the mid-1990s, its route network's concentration in the U.S. Northeast and high operating costs prompted calls to merge with another airline. On May 24, 2000 US Airways announced plans to be acquired for $4.3 billion by UAL Corp., the parent company of United Airlines, the world's largest commercial carrier at the time. The complex deal drew immediate objections from labor unions, consumer advocates, and antitrust regulators. Negotiations stalled; with both airlines losing money and the deal all but certain to be blocked by the federal government, UAL withdrew its purchase offer on July 27, 2001, paying US Airways a $50 million penalty for withdrawing from the deal. Beginning in 2000, US Airways started retiring several aircraft types in an attempt to simplify its fleet to lower costs. These aircraft types were replaced by new A320 family aircraft. As the largest carrier at Washington-Reagan, US Airways was disproportionately impacted by that airport's extended closure following the September 11 terrorist attacks. The resulting financial disaster precipitated the closure of the airline's MetroJet network, which included the de-hubbing of the subsidiary's primary operating base at Baltimore-Washington International Airport, and the furloughing of thousands of employees. The airline entered Chapter 11 bankruptcy on August 11, 2002. The company received a government-guaranteed loan through the Air Transportation Stabilization Board and was able to exit bankruptcy after a relatively short period. On October 19, 2005, the loan was repaid when the debt was refinanced with other lenders. In early 2003, US Airways management liquidated the pensions of its 6,000 pilots, sending their pensions to the federal pension program, PBGC, or Pension Benefit Guaranty Corp. It was one of the first major airlines to drop pilots' pensions to save money, and other airlines have subsequently tried to do the same. Following an initial trial run of selling in-flight food in 2003, US Airways discontinued complimentary meal service on domestic flights. In August 2004, US Airways attempted to build a Latin American gateway at Ft. Lauderdale-Hollywood, announcing service to 10 cities in Latin America and the Caribbean. The attempt was largely unsuccessful and short-lived, in part due to Fort Lauderdale’s proximity to American Airlines’ hub at Miami International Airport, with access to an extensive Latin American network. In an attempt to stem further financial losses, in November 2004 US Airways officially de-hubbed Pittsburgh International Airport, and began a process of de-emphasizing its hub-and-spoke system to capitalize on direct flights between major eastern airports such as Washington-Reagan, New York-LaGuardia, and Ft. Lauderdale-Hollywood. This emphasis on more direct flights has been undertaken by many airlines of late, as an attempt to capitalize on the highest-profit routes, and is modeled after Southwest Airlines' system, one which most U.S. airlines used until the mid-1980s. However, high fuel costs and deadlocked negotiations with organized labor (chiefly the Air Line Pilots Association, who were traditionally the first group to come to a concessionary agreement) forced US Airways into a second round of Chapter 11 bankruptcy protection proceedings, on September 12, 2004. Widespread employee discontent and irregularly high sick calls were blamed by the airline for a staff shortage around the 2004 Christmas holiday, a public relations disaster which led to speculation that the airline could be liquidated; the USDOT, however, found that the problems were caused mainly due to poor planning by management. On May 19, 2005, US Airways Group announced that it would merge with Arizona-based America West Holdings Corporation (parent company of America West Airlines), whose strength in the West would complement US Airways' routes in the Northeast, Europe, and the Caribbean. The new entity retains the US Airways name due to its non-regional emphasis, as well as its greater worldwide brand recognition, its Dividend Miles frequent flyer program, and its participation in the Star Alliance. Equity partners include Air Wisconsin Airlines Corporation and ACE Aviation Holdings. The merger resulted in a large loss of control by former US Airways executives as the new US Airways is headquartered at the former America West corporate offices in Tempe, Arizona, and America West executives and board members are largely in control of the merged company. The merger with America West Airlines will include consolidating all aircraft under the US Airways certificate, was completed in September 2007, approximately two years following the merger of the holding companies in 2005. For the initial merger announcement, click here. Also, see: Merger with US Airways Group for additional information. On September 13, 2005, America West's shareholders voted to approve the merger agreement with 95.5 percent of shareholders approving the transaction. On September 16, 2005, the U.S. Bankruptcy Court for the Eastern District of Virginia approved US Airways' Chapter 11 Plan of Reorganization, clearing the way for the merger to be closed on September 27, 2005, in conjunction with US Airways Group's emergence from bankruptcy. On September 27, 2005, the merger of the two holding companies was completed. The combined airline has branded itself as the "World's Largest Low-Fare Airline". During 2006 the airline began consolidating its operations under the US Airways brand; operations are expected to be fully integrated by 2007 after government approval allowing the airlines to operate under a single operating certificate. 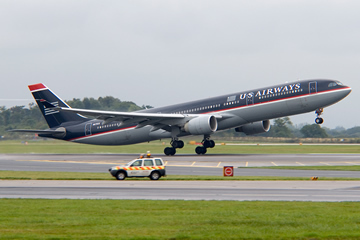 Until this happens, the former America West aircraft and destinations are operated under a separate certificate and by separate crews, but the flights are marketed and sold as US Airways. Check-in counters are still maintained for both US Airways and America West, but most only display US Airways signage. In January 2006, the airline began consolidating its operations under the US Airways brand, and all America West flights became branded as US Airways flights. On February 9, 2006, US Airways announced that it would become the first US-American "legacy" carrier to add the Embraer 190 to its mainline fleet. In May 2006, the US Airways and America West web sites were merged. The new US Airways web site unites the two brands using graphics and styles reflective of the airline's new livery and services. The end of 2006 saw US Airways making a bid for competitor Delta Air Lines, which opposed this bid and takeover by US Airways. The final bid was valued at $10 billion but was withdrawn on January 31, 2007, since US Airways failed to secure backing from Delta's creditors. The airline has stated that it will no longer pursue a possible takeover of Delta. In retrospect, the market capitalization of Delta has been around US$ 4.5 to 6 billion, so the offered price would not have actualized. Most pre-merger US Airways aircraft were equipped with Verizon Airfone at every row of seats. However, since Verizon ended this service, the airline has deactivated the service and as of 2007, removed the phones or have covered them up from all aircraft. During the night of March 4, 2007 the US Airways and America West computer reservation systems were merged. US Airways, which previously used the Sabre airline computer system, switched to the new QIK system, an overlay for the Shares system which is based on the Amadeus computer reservations system, which had been used by America West. A few of the features from the Sabre system were incorporated into the new joint system with the most prominent being the continued utilization of the Sabre ramp partition "DECS" for all computer functions related to weight and balance, aircraft loading and technical flight tracking within the company with Former America West employees being fully trained and implemented into the old East system on September 25, 2007. America West Airlines was completely merged into the US Airways certificate on September 25, 2007. This completely eliminated the America West name. Former America West employees including pilots, fleet service, flight attendants, and mechanics remain on their former union contracts, and have not completely merged work forces with their "east" (pre-merger) counter parts. Former America West aircraft still fly with their respective crews and use the call sign "Cactus", while former US Airways crews fly with their aircraft, and still use the call sign "US AIR". Aircraft were still operated by US Airways or America West crew and the aircraft were under two different United States Department of Transportation operating certificates until September 25, 2007. However, until pilot union groups negotiate one contract, pilots will fly only on their airlines' aircraft and flights will be marked accordingly. Now that the computer systems are merged, America West operated flights are marketed as though America West is a wholly owned carrier. This marketing is common practice for airlines that have code share agreements with other airlines operating the aircraft for feeder or regional routes. This practice is not common for all major airlines, but greatly simplifies the process for a passenger connecting between the US Airways and America West operated flights. On the morning following the systems' merger, problems surfaced almost immediately. QIK check-in kiosks at several major US Airways hub cities began to malfunction. Although the new system was stable, there were connectivity problems with the kiosks that originally connected to the Sabre system. One of the major problems was with the common use system that some airports (like Las Vegas, Charlotte, Philadelphia, and others) use. Thousands of affected passengers found themselves in long lines having to check-in with an agent. Web checkins were not affected. 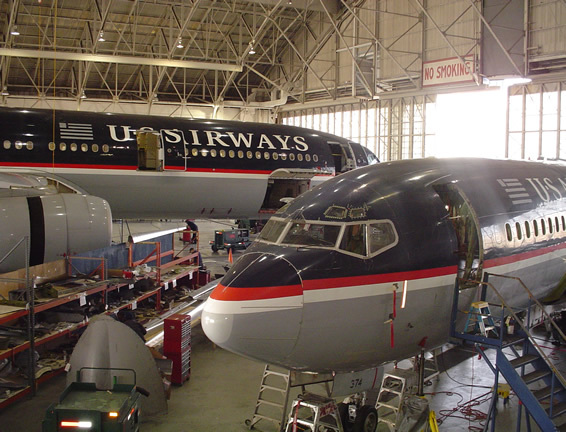 Over half of the US Airways fleet has not been repainted (but some already labeled for the "old" US Airways), and only a few of the interiors of the previous airlines has been refurbished. Currently the only interiors that have been refurbished are the Boeing 757 (international and domestic) and the Boeing 767 fleets with new blue leather seats in coach and the same blue and red color "swoosh" theme from the new aircraft livery printed on the bulkhead walls. So even though aircraft operating certificates have merged, aircraft interiors will remain the same for the time being. The airline in the summer of 2007 will be upgrading its in-flight service, from food and training for flight attendants. The airline will also begin test marketing a new seat back entertainment system in early 2008. A Consumer Reports survey of 23,000 readers released in June 2007 ranked US Airways as the worst airline for customer satisfaction. The survey was conducted before the airline's March 2007 service disruptions. A follow up survey with a smaller sample size conducted in April 2007 found US Airways remained in last place, with its score dropping an additional 10 points. US Airways ranked last out of 20 domestic airlines for systemwide on-time performance in March, April and May of 2007 according to the US Department of Transportation figures. US Airways east pilots are taking steps to dump their ALPA membership and form their own in-house union. They complain that ALPA has shown an unfair bias towards US Airways west (formerly America West) pilots at the expense of the legacy east pilots. East pilots (3,200) outnumber west pilots (1,800) and the proposed union's president states that they have a sufficient number of requests to force a vote. The new union would be called the US Airline Pilots Association (USAPA). As of September 2007, US Airways continued to downgrade Pittsburgh International Airport's status from 500 flights a day (with 11,000 employees) in 2001 to just 111 flights a day (with only 2,745 employees). CEO Doug Parker stated its frustration with PIT being an unprofitable airport and more cuts may be on the way. This represents a further deterioration of a strained relationship with Allegheny County with which it has important historical ties. US Airways Group Inc. said October 3,2007 it would cut mainline flights from Pittsburgh International Airport to 22 a day from 31 and reduce regional flights to 46 a day from 77, starting January 6. On September 25, 2007 US Airways was awarded a route by the DOT to serve Charlotte to Beijing via PhiladelphiaThis marks the first direct route to China from Philadelphia and is scheduled to begin flying in March 2009. US Airways threatened to withdraw from the China proposal if Philadelphia International Airport allows Delta Air Lines to enter Terminal A East. On September 26, 2007 the US received Single FAA certification. On October 29, US Airways announced that they will apply for daily service between Charlotte, North Carolina and Bogotá, Colombia when the U.S. Department of Transportation (DOT) begins selecting carriers for 21 new weekly flights to the South American nation. On November 11, 2007, US Airways announced nonstop service between Philadelphia and London's Heathrow Airport. On December 12, 2007, Airliners.net forum members reported US Airways has added a $5.00 surcharge when booking online fares. USAir - "Fly the USA on USAir"
USAir (early 90s) - "USAir Begins With You"
US Airways (early 2000s) - "Where I fly the Flag"
US Airways (post-first bankruptcy) - "Clear Skies Ahead"
US Airways (Post Merger) - "Fly with US"
US Airways has had various different liveries both under the US Airways and USAir name. In general the Express and Shuttle divisions have had liveries that closely parallel the company-wide livery at the time. US Airways operates approximately 3,860 flights a day to 241 destinations in 30 countries from its hubs in Phoenix, Philadelphia, Charlotte, and Las Vegas. A US Airways Airbus A319 plane on final approach for Reagan National Airport.US Airways' routes are heavily concentrated in the Eastern United States, Western United States, and Caribbean, with a number of routes to Europe and several destinations on the west coast. Their west coast presence has increased dramatically following the merger with America West Airlines. Codesharing with United Airlines has dramatically helped US Airways by allowing the airline to offer its customers extensive service throughout the Midwest, Great Plains, and Rocky Mountain states. Services to South America, Asia, and Australia are also provided via the United Airlines codeshare. Likewise, United passengers benefit from increased access to the Eastern Seaboard and South, Europe, and the Caribbean. US Airways Express carriers operate a number of routes, primarily into US Airways' hubs and focus cities, but with a few exceptions, in particular where smaller US Airways Express carriers operate service under the EAS program, and also some point-to-point routes in the northeast and Carolinas. In February 2007 the airline announced that their official operations center would be located in Pittsburgh, Pennsylvania. On July 16, 2007 US Airways announced it had applied with the Department of Transportation for nonstop service between Philadelphia and Beijing. If approved, the flights would begin in March 2009 and would utilize Airbus A340 aircraft and would originate in Charlotte using a Boeing 767. On September 25, 2007 The Department of Transportation stated they have tentatively awarded US Airways, Charlotte-Philadelphia-Beijing route to begin in March 2009. On November 11, 2007, US Airways announced nonstop service between Philadelphia and London's Heathrow Airport, its first-ever service to that airport. 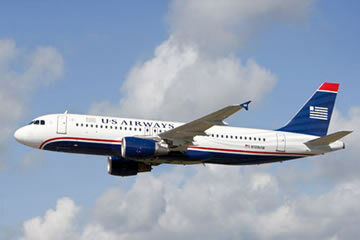 US Airways will retain service between Philadelphia and London Gatwick, as well as Charlotte and London Gatwick. The airline has also applied for flights to Bogotá, Colombia starting in 2008 from Charlotte. US Airways fly a fleet of 357 twinjets, divided between mostly newer Airbus aircraft and generally older Boeing aircraft. US Airways operates 358 aircraft. The combined airlines operate the largest fleet of Airbus aircraft in the world. Former America West aircraft are still based out of Phoenix and Las Vegas with the exception of some Airbus A321s that have been transferred to Phoenix.